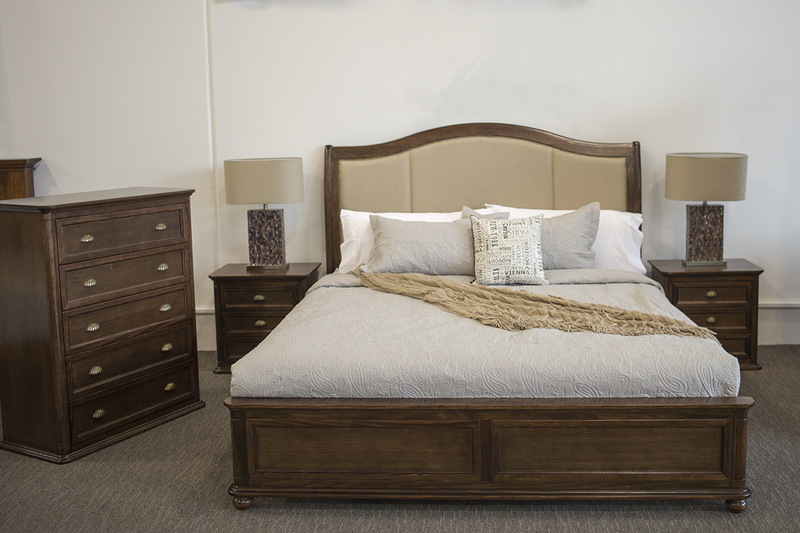 The Annabelle suite, made from Tassie Oak, is a classy, elegant bedroom suite that will add its own distinct style to your bedroom. It has a beautiful, polished finish, which is smooth to the touch, without being too shiny. 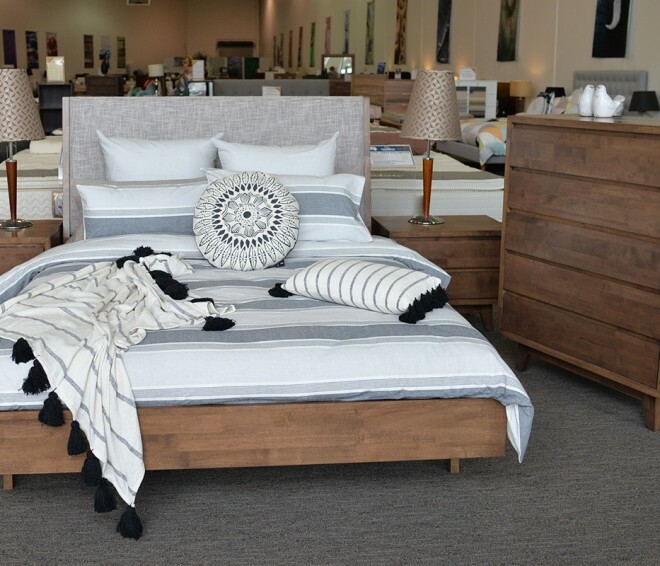 The bed itself is shown to sit on rounded wooden feet, which the bedsides and the tallboy have the option to do as well, or they can sit on the floor, as they are shown to do in this picture, giving you the option of how you want them to look in your room. The foot of the Annabelle has a couple of carved panels, with exquisite lines and curves. The head board is of a simplier design than the foot but it features a high quality, padded panel with a strong, fawn coloured, textured fabric, over firm padding and surrounded with brass studs with a floral finish. 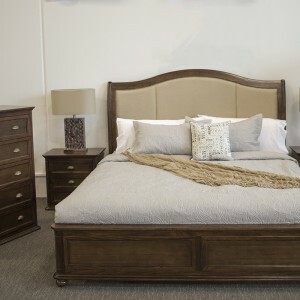 The case goods have strong lines and rounded corners, as well as panels that match the foot of the Annabelle bed. The handles are brass, which match the brass studs on the bed head in both colour and design, but are half circles, giving the appearance of sea shells. The drawers run smooth and quiet on metal glides. There are sturdy slats on the base of the bed, as well as a centre rail for extra support. 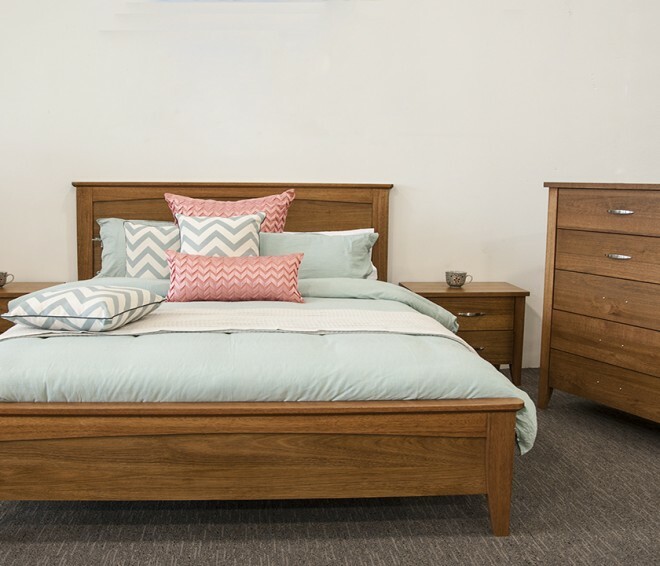 The Annabelle suite is available in Queen and King sizes only, with the King suite on display at our Grovedale Mega Showroom in Torquay road.